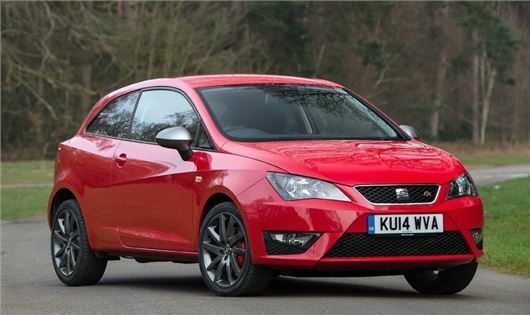 A new low-CO2 warm hatch version of the SEAT Ibiza is likely to see its appeal grow with company car drivers. The new 140bhp ACT petrol engine replaces the 150bhp 1.4 TSI engine in the Ibiza range, offering similar performance but delivering a 12.2 mpg official fuel consumption improvement, and 30 g/km less CO2 - down to 109 g/km. Available with a manual transmission only, the standard 1.4 TSI ACT FR 140 PS is also £1,015 cheaper than the 150bhp car it replaces, which came with a DSG automatic gearbox as standard. SEAT ihas also unveiled the FR Edition, which uses the ACT engine but sits above the standard FR in the Ibiza range, to mark the introduction of this ground-breaking technology - a first for SEAT. The FR Edition, in addition to the usual FR specification, adds red seatbelts, red brake callipers, titanium-coloured 17-inch alloy wheels, matching coloured door mirrors, climate control and dark tinted rear windows. Available in SC and five-door body styles, the FR Edition costs £15,920 and £16,470 respectively. The premium for the FR Edition is £600, although the cost of specifying its additional equipment s options would be £1,130. BIK taxation drops from 20% to 14%. The 1.4 TSI engine with Active Cylinder Technology shuts off the second and third cylinders at low engine speeds and when low torque outputs are required. It does so seamlessly, and conversely it will re-activate the cylinders in undetected fashion when more torque is required. The transition between two- and four cylinders takes less than 40 milliseconds, and the system can save up to one litre of fuel over 60 miles of careful urban driving. The Ibiza FR Edition and the Ibiza FR 1.4 TSI ACT are available to order now.